The “subgrade” is the in situ material upon which the pavement structure is placed. Although there is a tendency to look at pavement performance in terms of pavement structure and mix design alone, the subgrade can often be the overriding factor in pavement performance. Load bearing capacity. 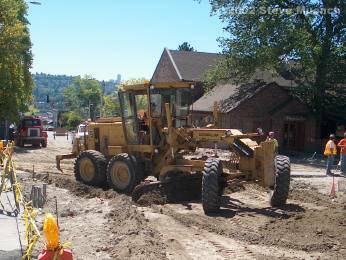 The subgrade must be able to support loads transmitted from the pavement structure. This load bearing capacity is often affected by degree of compaction, moisture content, and soil type. A subgrade that can support a high amount of loading without excessive deformation is considered good. Volume changes. Most soils undergo some amount of volume change when exposed to excessive moisture or freezing conditions. 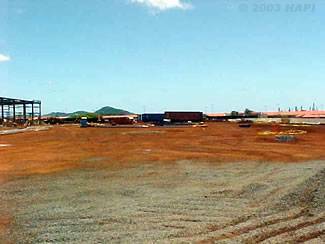 Some clay soils shrink and swell depending upon their moisture content, while soils with excessive fines may be susceptible to frost heave in freezing areas (not really a concern in Hawai’i). Ash, especially on the Big Island, can present volume change problems. Removal and replacement (over-excavation). Poor subgrade soil can simply be removed and replaced with higher quality fill. Although this is simple in concept, it can be expensive. Stabilization with a cementitious or asphaltic binder. The addition of an appropriate binder (such as lime, portland cement or emulsified asphalt) can increase subgrade stiffness and/or reduce swelling tendencies. Additional base layers. Marginally poor subgrade soils may be made acceptable by using additional base layers. These layers spread pavement loads over a larger subgrade area. This option is rather perilous; when designing pavements for poor subgrades the temptation may be to just design a thicker section with more base material because the thicker section will satisfy most design equations. However, these equations are at least in part empirical and were usually not intended to be used in extreme cases. In short, a thick pavement structure over a poor subgrade may not make a good pavement. California bearing ratio (CBR). A simple test that compares the bearing capacity of a material with that of a well-graded crushed stone (thus, a high quality crushed stone material should have a CBR of about 100%). CBR is basically a measure of strength. It is primarily intended for, but not limited to, evaluating the strength of non-stabilized cohesive materials having maximum particle sizes less than 0.75 inches (AASHTO, 2000). It was developed by the California Division of Highways around 1930 and was subsequently adopted by numerous states, counties, U.S. federal agencies and internationally. Most agency and commercial geotechnical laboratories in the U.S. are equipped to perform CBR tests. Resistance value (R-Value). A test that expresses a material’s resistance to deformation as a function of the ratio of transmitted lateral pressure to applied vertical pressure. It is essentially a modified triaxial compression test. Materials tested are assigned an R-value. The testing apparatus used in the R-value test is called a stabilometer and is identical to the one used in Hveem HMA mix design. The R-Value is basically a measure of stiffness. Resilient modulus (MR). A test used to estimate elastic modulus (a material’s stress-strain relationship). The resilient modulus test applies a repeated axial cyclic stress of fixed magnitude, load duration and cycle duration to a cylindrical test specimen. While the specimen is subjected to this dynamic cyclic stress, it is also subjected to a static confining stress provided by a triaxial pressure chamber. It is essentially a cyclic version of a triaxial compression test; the cyclic load application is thought to more accurately simulate actual traffic loading. Resilient modulus is basically a measure of stiffness. There are many different correlation equations between CBR, R-value and resilient modulus. Each one has its limitations, which should be headed. Table 2 presents some of the more popular correlation equations. MR = (1500)(CBR) Heukelom & Klomp (1962) Only for fine-grained non-expansive soils with a soaked CBR of 10 or less. MR = 1,000 + (555)(R-value) 1993 AASHTO Guide Only for fine-grained non-expansive soils with R-values of 20 or less. MR= 2555 x CBR0.64 AASHTO 2002 Design Guide A fair conversion over a wide range of values.